Dreaming Of Danzan Ravjaa: Those Bustards! The response to the last post has been a liiiiittle feeble, and it occurs to me that I should have warmed y'all up with a joke. So here goes. Everyone knows of my peculiar obsession with avifauna, that is to say, boids. This afternoon I attended a wonderful lecture at the American Center for Mongolian Studies that I had been eagerly anticipating. 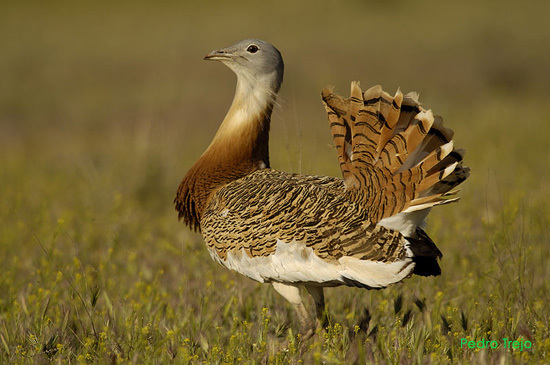 Aimie Kessler, a graduate student at Arizona State, was to present a PowerPoint discourse on "The Great Bustard in Mongolia: Research and Conservation." That's not the joke! Quit it. Anyway, as I was saying, she began with a natural history of the bustard (I said quit it!). This contained a couple if nice, quirky facts. It is, for example, the heaviest flying bird. The males can tip the scales at 46 lbs. (Who said "fat bustard"? You're excused.) And in this species there is an extreme difference in size between the sexes (this is known as sexual dimorphism, if you must know, which I think is prohibited for me in a sub-clause of monastic rule #247). The females are quite a bit smaller and more cryptically colored. Almost impossible to see if they're crouching. These guys like long-grass steppe and low-intensity farmland. The female lays 2-3 eggs virtually in the open. After performing his reproductive role, the male bolts, leaving the female to raise the young on her own. The theory advanced by Aimie for this deadbeatedness was that because of the male's much larger size, his presence near the nest would be too obvious a marker for the steppe's many predators that fancy such chicks as a snack: foxes, eagles, and the like. In my head, I disagreed. Seemed to me they were just a bunch of selfish bustards. Ba-dum-bum. I'll be here all week. Try the buuz and don't forget to tip your zogch. Now, will you help send these nuns to India? Seeing the dearth of har-de-har comments, I realized to my horror this morning that some might have interpreted this post as me saying those who hadn't given to the nuns are "selfish bustards." This is absolutely, 100% NOT what I was saying at all. I know how these things go. I just thought it was a funny thing to say and it'd make you laugh. Saying funny things and making people laugh is my greatest pleasure in life. Esp. if over a cuppa good coffee. Been staying up late at night again? I was hoping it was heading toward a "They killed Kenny!" moment. Someone else has been staying up late at night again. okay, okay, Little Caesar shook the pennies outta my pockets and I got dizzy hangin upside down....its on its way...just don' hurt me nomore.. Yes, Irina, it's an inescapable fact -- the reach of the syndicate of long-eared hares, ungainly land birds, and other small, watchful critters is vast. Thanks so much for your contribution! This is amazing beast this bustard! I have seen it before somewhere, but I can't recall where exactly.